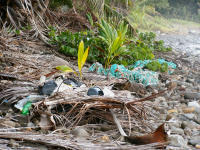 The ubiquitous presence of marine debris, coupled with its physical, ecological and socio-economic complexities, poses a severe threat to the sustainability of the world’s natural resources. Marine debris – man-made objects that enter the marine environment through careless handling or disposal, intentional or unintentional release, or as a result of natural disasters and storms – is one of the ocean’s most pervasive, yet potentially solvable, pollution problems. 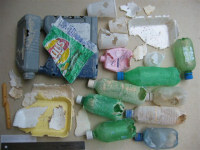 Litter and debris along the coast, including on sea turtle nesting beaches, soon makes its way to the sea where turtles and other marine creatures may consume it and be injured or killed as a result. Since both sea turtles and the tourism industry – not to mention the broader ocean – benefit from clean sandy beaches, it is important to remove (and dispose of) litter and debris in an environmentally sound way. 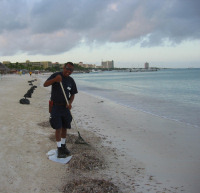 Hoteliers and municipalities can take preventative measures to reduce the amount of garbage discarded on or near nesting beaches by the convenient placement of waste receptacles. Receptacles must be emptied often so as not to become unsightly and/or attract unwanted predators (including dogs, mongoose, rats, foxes, vultures and seagulls) of sea turtle eggs and hatchlings. Equally important are our efforts to reduce the volume of waste that we produce, and to recycle as much as we can. 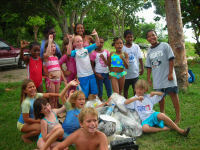 It is a common occurrence throughout the Caribbean that local conservation groups, in partnership with youth, organize community-sponsored beach clean-ups, enticing volunteers with incentives such as free prizes and food. 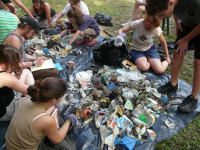 Members of the hospitality sector often become involved in these campaigns by paying for garbage bags, sponsoring bus transportation or water for volunteers, or donating prizes. 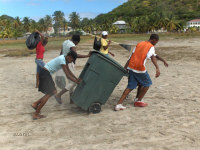 Beach clean-ups offer a wonderful opportunity for people to become involved in keeping the nesting beach safe for sea turtles and sanitary for beachgoers.